The tension in my shoulders is melting. The tightness and ache in my jaw and throat are releasing. The constant, exhausting, mental jabber is growing silent. The resolute soldiering on, pushing forward without awareness, without seeing anything, but a goal which constantly recedes over the horizon, is giving way to being here now. The tunnel vision squint and laser focus are opening and broadening to a wide spacious plain that keeps revealing more and more. Reality unfolds like an undulating wave continuously turning up complexities, beauties, grace, and both harsh and comforting aspects of what is really going on. I have been decelerating and decompressing over the past several weeks. This process is not over, for it is the work of a lifetime. I need more time to shed the brain debris and external and internal clutter. I need to continue to tame the habit of acceleration, and restrain my inner harpy, that merciless harridan of self aggrandizement. Though I have tried to practice and teach this for years, I feel like a rank beginner. And, as is the way of the Spirit, I am being shown how far I have to go. I am watching my many-faceted resistance, as I begin the slow, groaning, screeching grind to a halt. For ironically, in order to go further on this journey, I have to stop. Sabbath sense is anything that makes spacious what is cramped. That makes large out of small, simple out of complex, choice out of obligation. Sabbath sense is anything that reconnects the necessities of drudgery to the marvelous uselessness of beauty. Sabbath sense is acknowledgment of the presence of Spirit in the petty and the profound. In this time of beginning and transition, of halting and rest, I have discovered a different kind of urgency, than the urgency of schedule, production, and accomplishment. This is the urgency of a compass, a magnet, an urgency so primal it is like breath itself. This is the urgent love of the Maker of All honing into each particle of creation, boring into us and drawing us inexorably to itself. I have always been attracted to sparse, barren, open spaces – the high alpine tundra, and the edges of the tree line. 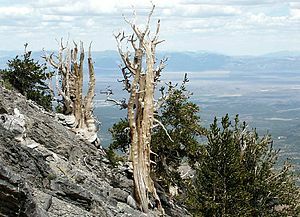 There for over five thousand years the bent and twisted Bristlecone Pines dance their gnarled tango with the howling storms and eye the prize for the oldest continuous living residents on this planet. I look at maps for the wind-scoured boulder fields, the isolated islands, and the endless expanse of ice sheets at the poles. These places both fascinate, and frighten the wits out of me. Each poem is a miracle that has been invited to happen. I must be willingly fallible in order to deserve a place in the realm where miracles occur. So I am heading out to the edges of my infallibility, that terrifying point where I and all I can think and do and figure out and hum to myself ends, and God begins. Today I say that to live a life of prayer, I must go out to the edges of myself and my security. I must go beyond my ego to the outer banks, to my own fallibility, where the edges of the sea of God wash over my toes and beg me to fling myself into that deep Immensity. I do not want to be safe. I do not want any part of a faith or a God or a religion that is safe. I want to stand in the barren field of the world, strewn with boulders, with only our wounds and fallibility, and without a prayer, a blog, a book, or a penny in my pocket, but the brooding mercy of God. It is not a comfortable, quiet life of ease that God is calling me to, here in my retirement. It is to a life of surrendered love, where my meat and drink, and every breath are drawn from the grace of God. I am fearfully and gratefully being towed through fallibility to a place in the realm where miracles occur. This entry was posted in apophatic spirituality, Christianity, Contemplation, prayer, God, Prayer, The praying life and tagged adventure, God, Miracle, Religion and Spirituality, risking faith, sabbath, surrender, William Stafford. Bookmark the permalink. It’s so tempting to enter that space with you. Although my call is not yet to retire (I’m pretty sure? ), you give retirement from serving the parish a whole new edge that’s frightening, scary, & challenging! Much to contemplate.